When Gossip Girl showrunner Josh Safran took over NBC’s Smash, he knew he had to expand beyond the show’s existing centerpiece: Bombshell, a nostalgic Broadway musical about Marilyn Monroe. For season two, he introduced a competing show-within-a-show, the original rock musical Hit List. Unfortunately, in the interest of showcasing over a dozen new musical numbers, most of the story exposition ended up on the cutting room floor. That’s left some puzzling gaps for viewers to fill in this central but vague show — and though admirable attempts were made (particularly on the Smash Wiki), nobody seems to have quite gotten it all, says Safran. “At least with Bombshell, if you had a passing understanding of Marilyn, you understood enough,” Safran acknowledges. 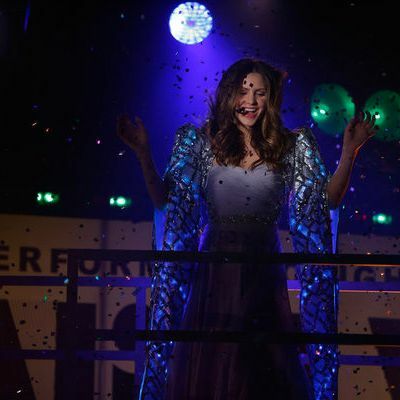 “And we made the choice to do an original musical, where we hoped the emotions of the song were more important than the plot, because they actually mirrored what the characters of Smash were going through during the show.” But make no mistake: There is a plot to Hit List, which was carefully outlined by Safran and his staff. Initially, the writers toyed with the idea of doing “a modern-day Hamlet in the pop world,” but worried that it wouldn’t translate as a recognizable story. Instead, they channeled Safran’s fascination with modern musical divas (Lady Gaga, Pink, Madonna) into a tragic fable about the mutability of fame and identity. Here, for the first time, is the official synopsis of Hit List. The Diva comes to Amanda’s concert, just another fan in the crowd. She moves through the throngs, singing a haunting song a cappella (“Broadway Here I Come”). When she reaches the front, she points her gun and shoots. Who does she hit? We flash back to the beginning of the story, where we meet Jesse, a struggling songwriter (and recovering addict) in Greenpoint with a dead-end life and no hope of getting out. He works as a bartender. Amanda is a poor little rich girl from the Upper East Side who dreams of being a pop star, but doesn’t have enough of a defined look or style in both her self and her songs. They both dream they can change their lives, but know they truly can’t (“Rewrite This Story“). Amanda gets a big meeting with a record label and plays them one of her songs (“Good For You“) – while fantasizing about performing in a club – but they don’t like the song. Rejected for the last time, she contemplates suicide on the side of the East River (“Broadway Here I Come (Reprise)“) until Jesse rescues her. [This is the first time we hear the full version of “Broadway Here I Come.”] Jesse plays her one of his songs on a bridge (“The Love I Meant to Say“), and they connect. He dreams that together maybe they can get out. Amanda watches The Diva perform on the VMAs (“Reach for Me“), and hears a little bit about her backstory and how she came to be The Diva. After a terrible dinner with her family in which they tell her they will no longer financially support her if she continues to pursue her pop dreams, she decides to do the same (“Original“). Jesse is anxious for a second date, as he has fallen in love with her. They spend the night together, but while he’s asleep, she steals his songs and leaves. When he wakes up in the morning, not only is Amanda gone, but she’s disappeared altogether, last seen by the water where she first met Jesse. Her family believes she has finally committed suicide. Jesse fears all is lost, until one day when he hears one of his songs on the radio (“The Love I Meant to Say (Reprise)“) sung by someone he knows is her, even though the singer is called “Nina,” and has come out of nowhere. Jesse sets out to find her in Los Angeles (“I Heard Your Voice in a Dream“), culminating in a confrontation at her first big gig. Because he loves her, Jesse agrees to keep supplying “Nina” with music, even though she wants to make sure no one even finds out who he is. Under pressure to keep delivering for her, and because he is hidden away, he quickly falls back into drugs as he watches Nina play the part of the superstar. Nina sings a song Jesse has written for her about loving someone who makes it hard to love them (“Don’t Let Me Know”), and it launches her. Nina auditions for a big-time manager, JB – who’s reluctant to sign her – on the spur of the moment at a coked-up party in his palatial Hollywood Hills home (“Pretender”). He does sign her, but he wants her as more than just a client. She resists, which only makes him want her more. He pairs her up with The Diva, his biggest client, to make a single and video. They do, and it is successful, but a bitter rivalry begins. After they perform the song together at the VMAs (“I’m Not Sorry“), The Diva ends up having a very public meltdown, and Nina ascends to the top of the charts. Jesse waits to find out if Nina will choose him or her career (“I Heard Your Voice in a Dream (Reprise)”). A greedy and unrepentant Nina publicly humiliates The Diva, driving Jesse to realize he can no longer love what Amanda has become. He leaves to the hotel penthouse, denying her any more music until she changes who she is (“Caught in the Storm“). Hopeful she will change, he waits for her at their bridge. She doesn’t arrive. Nina succumbs to JB’s desires. The Diva returns to her hometown as who she used to be, Sara Smith. No one recognizes her, or believes she is who she says she is. Her family has moved, her friends don’t know her. She feels more alone than ever before (“[TBD Returning Home Song]“). Back in Greenpoint, Jesse gets himself clean, watching from afar as Nina struggles to maintain her success without his songs. It becomes impossible, and at the VMAs, she tries to sing a version of her old song (“Good For You (Reprise)”) that fails miserably. Nina spirals downward. Eventually, she comes back to Jesse, meeting him back at their bridge, and she sings about how she wants to change back into who she used to be, if he’ll be there with her (“Heart-Shaped Wreckage“). Jesse helps Nina become Amanda again, and due to all her experience, her work has grown, and she is able to get a meeting with the same record executives from the beginning, who have no idea who she was. (Nina has vanished from the world, everyone wanting to know who she was.) Amanda gives her first concert as herself; it is not a huge success, but she’s on the way. Jesse is incredibly proud of her. As she sings her final song (“Broadway Here I Come (Reprise)“), The Diva arrives and shoots Amanda, killing her. Jesse sings to Amanda as she dies in his arms on stage at the concert (“The Love I Meant to Say (Reprise)”). Jesse is back at zero, but now feels renewed to keep trying in the shadow of Amanda’s legacy. Due to the notoriety over her violent act, The Diva is on top again. At the end of the show, Jesse says goodbye to Amanda as The Diva is back on top, even more famous in her infamy – although the next Amanda is somewhere out there to take her down (“The Goodbye Song”).